Markram is likely to open the batting for the hosts along with Quinton de Kock. 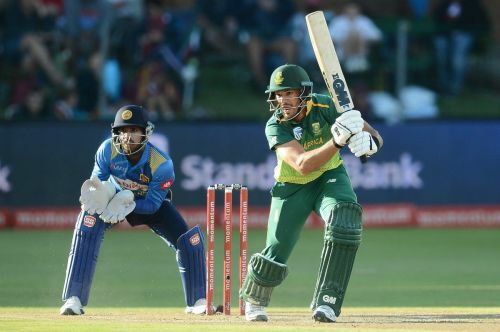 After hammering the Sri Lankan team by 5-0 in the ODI series, South Africa is set to host the Lankan Lions for the first T20I at the Newlands, Cape Town. South Africa has been flying high on the back of some clinical performances since their test series defeat earlier in this tour. The visitors, however, are still struggling to find their feet in the limited-overs format. Both the teams will battle it out once again in the shortest form of the game for the three-match series starting tomorrow. South Africa has played some superb cricket throughout the home leg. The hosts whitewashed the Lankan team by 5-0 in the ODI series showing their dominance and consistency in the 50-overs format. The Proteas must be beaming with confidence after such a clinical performance ahead of the ICC World Cup 2019. South Africa has named two squads forward of the series- for the first T20I and the remaining two games. Faf du Plessis will lead the side in the opening T20I while JP Duminy will lead the home team in the final two matches in du Plessis’s absence. On the contrary, Sri Lanka has been in terrible form since the beginning of this year. After that humiliating loss, the visitors would be eyeing to land a counterpunch heading into this T20I series. Having won the test series by 2-0, Sri Lanka finally looked to announce their comeback on the international stage as they became the first Asian team to win a test series in South Africa. However, their joy was shortlived, and they were thrashed in the ODI series by 5-0 much to their embarrassment. With the ICC World Cup in sight, Malinga & Co would be hoping to end this forgettable tour on a high. Hashim Amla will miss the series due to his personal reasons. Aiden Markram, Anrich Nortjé and Sinethemba Qeshile have been included in the squad. Sri Lanka has named Suranga Lakmal, Sadeera Samarawickrama and Jeffrey Vandersay in the squad. While Upul Tharanga and Kusal Perera have been sidelined for this T20I series. Imran Tahir‚ Lungi Ngidi‚ JP Duminy‚ Faf du Plessis (c)‚ Dale Steyn‚ Andile Phehlukwayo‚ Quinton de Kock‚ Reeza Hendricks‚ Aiden Markram‚ David Miller‚ Anrich Nortje‚ Dwaine Pretorius‚ Kagiso Rabada‚ Tabraiz Shamsi‚ Rassie van der Dussen.